Brant Ramm with Sweetie and Sable. Photo by John Joyner/NC State Veterinary Medicine. Brant Ramm describes himself as a certified dog person. He has concrete proof. 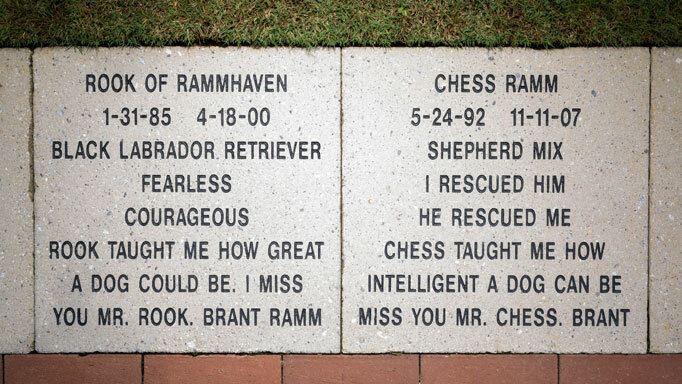 Specifically, he has four 18-inch stone pavers, side by side, on the NC State College of Veterinary Medicine’s Walk of Honor commemorating his extraordinary bond with his extraordinary canine companions. The Walk of Honor is a network of stone and brick walkways traversing the CVM campus. Donors memorialize a beloved pet or honor a medical professional, friend or family member through messages inscribed on a brick or paver. Brant decided the bricks weren’t large enough to accommodate everything he wanted to say about his dogs, so he opted for the more substantial pavers. Ramm’s first dog was a black lab named Rook. Born in 1985, Rook is described as fearless and courageous on his paver. It also says Rook taught me how great a dog could be. In 1996, Rook took a hard fall and ruptured his spleen. In the course of being treated for that injury, it was discovered that Rook was suffering from testicular cancer, and that’s how Ramm first turned to the NC State Veterinary Hospital for help. He credits the excellent care that Rook received for his eventual recovery. At one point when Rook was in intensive care he was non-responsive. When Ramm went to see Rook, he was brought out on a cart. He was on his side and wasn’t moving. But when Ramm called his name, Rook lifted his head and looked around, much to the surprise of the attending vets. Rook perked up and was discharged two days later. Ramm says that he and Rook usually spent so much time together that the dog simply felt that he had been abandoned and was essentially giving up. Ramm’s return visit gave Rook a reason to get better, he believes. And he did get better, living to 15 ½ years old. Photo by John Joyner/NC State Veterinary Medicine. 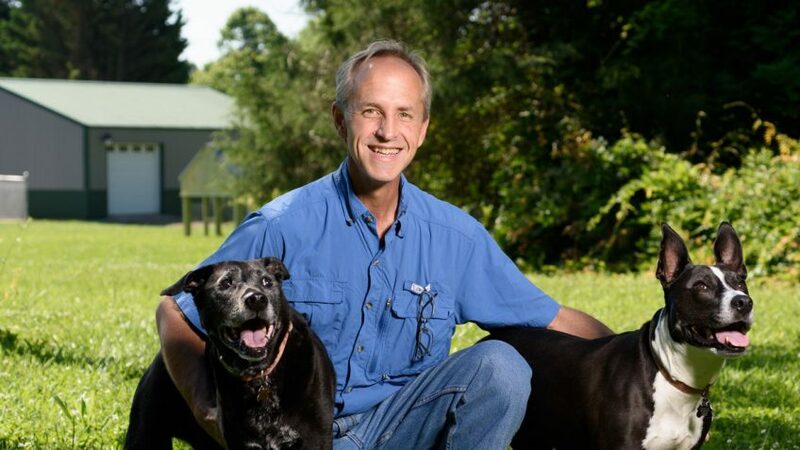 His relationship with his dogs was — and is -— a very important part of Ramm’s life. His other two pavers on the Walk of Honor are blank because his two other canine companions, Sweetie and Sable, are very much alive. Sweetie brought his connection with dogs to another level, Ramm said. Sweetie, 15, was discovered as part of a litter of puppies left in a dumpster in southern Virginia. Last year, Sweetie developed a gastrointestinal problem and was prescribed an antibiotic. Shortly afterward, she had a negative neurological reaction. Sweetie was unable to walk and showed signs of kidney and liver failure. 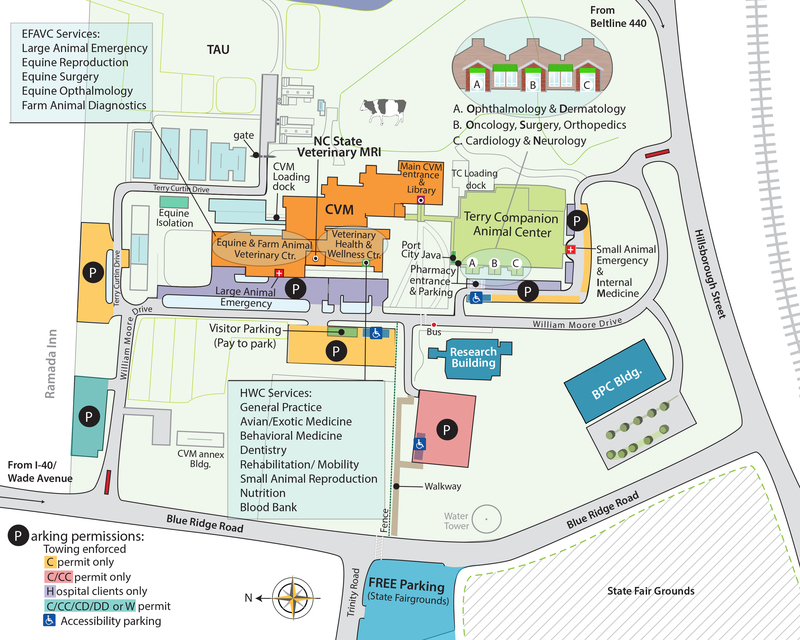 It turned out to be a complex situation to unravel, and Brant says “I don’t think anyone else could have figured it out” besides the clinicians at NC State. Although it has been a protracted recovery involving a change of medications, Sweetie has improved about 90 percent, he says. In keeping with his pattern, Ramm’s fourth dog is 8-year-old Sable, a Staffordshire terrier also rescued from a dumpster as a puppy. She had gone there to eat, apparently abandoned. Ramm says that he just happened to walk by her, and when he checked on her she jumped into his arms. Especially if you’re a certified dog person. How to Order: Adding a memorial brick to the Walk of Honor involves making a tax-deductible donation to the North Carolina Veterinary Foundation — $200 for a brick or $500 for an 18-inch stone paver — that will be used to support the teaching, healing and community service activities of the CVM. If you are interested in learning more about how to honor a friend, whether animal or human, please visit Walk of Honor page.